Hank Brian Marvin (born Brian Robson Rankin, 28 October 1941) is an English multi-instrumentalist, vocalist and songwriter. He is best known as the lead guitarist for the Shadows, a group which primarily performed instrumentals and was the backing band for Cliff Richard, and subsequently for Marvin, Welch & Farrar. 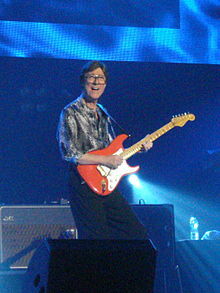 Hank Marvin was born Brian Robson Rankin in Newcastle upon Tyne, England. As a child, he played banjo and piano. After hearing Buddy Holly, he decided to learn the guitar. He chose his stage name while launching his career. It is an amalgamation of his childhood nickname, Hank, which he used to differentiate himself from friends also named Brian, and the first name of Marvin Rainwater, the country and rockabilly singer. Sixteen-year-old Marvin and his Rutherford Grammar School friend, Bruce Welch, met Johnny Foster, Cliff Richard's manager, at The 2i's Coffee Bar in Soho, London. Foster was looking for a guitarist for Cliff Richard's UK tour and was considering Tony Sheridan. Instead he offered Marvin the position. Marvin joined the Drifters, as Cliff Richard's group was then known, provided there was a place for Welch. Marvin met Richard for the first time at a nearby Soho tailor's shop, where Richard was having a fitting for a pink stage jacket. The Drifters had their first rehearsal with Richard at the Webb family home (Cliff's parents) in Cheshunt, Hertfordshire. His first critically lauded, self-titled solo album of instrumentals, which featured guitar set to orchestrated backing, was released in 1969, following the first disbanding of the Shadows, in late 1968. The single "Sacha" topped the singles chart in New South Wales, Australia, having been 'discovered' by two DJs at 2WG Wagga Wagga. Marvin's solo career was then suspended due to Shadows reunions, first for a Far East tour and 'live' album in 1969, then a studio album in 1970 (Shades of Rock) and again in the early 70s. He has experimented with styles and material, doing instrumental albums, some with mostly vocals (e.g. Words and Music, All Alone With Friends), one with only acoustic guitars and one with a guitar orchestra (The Hank Marvin Guitar Syndicate). In 1970, Marvin and Welch formed Marvin, Welch & Farrar, a vocal-harmony trio which failed to appeal to Shadows fans or to contemporary music fans. They became 'Marvin & Farrar' for a vocal album in 1973 and then reverted to the Shadows in late 1973, for the instrumental Rockin' with Curly Leads album. The Shadows came second for the United Kingdom in the 1975 Eurovision song contest. Marvin wrote "Driftin'", "Geronimo", "Spider Juice" (his daughter's name for orange juice), "I Want You to Want Me" for the Shadows, and "The Day I Met Marie". He co-wrote Richard's 1960 hit; 'Gee Whizz It's You' with Ian Samwell. With Welch, Brian Bennett, and John Rostill, he wrote hits for Cliff Richard, including; "On the Beach", "I Could Easily Fall in Love with You", "Time Drags By", and "In the Country". In 1969 and 1970, he teamed with Richard for: two 'Cliff & Hank' hit singles, his own song; 'Throw Down a Line' (also recorded by Marvin, Welch & Farrar), and 'The Joy of Living', while Richard also had a hit with his ecology song, 'Silvery Rain'. In 1977, Marvin played lead guitar on Roger Daltrey's third solo album, One of the Boys, on the tracks Parade and Leon. He co-wrote Olivia Newton-John's 1977 hit 'Sam' with John Farrar and Don Black, and produced albums for the British showman Des O'Connor. In 1988, Marvin collaborated with French keyboardist and composer Jean Michel Jarre on the track "London Kid", on Jarre's Revolutions album and was a guest in Jarre's Destination Docklands concert at London's Royal Victoria Dock. Jarre said the Shadows' success had influenced him and led to his decision to devote his career to instrumental music. Marvin appeared with Leslie Nielsen in an advert for Red Rock Cider, which was done as a parody of Nielsen's Police Squad! films. In a bar scene, Nielsen calls out, "Hey, you over there, in the shadows! ", after which Marvin steps forward. When Nielsen asks Marvin to "accompany" him (police talk for taking someone down to the station), Marvin literally accompanies him, on the guitar, as Nielsen sings the product's jingle. In 1992, Duane Eddy guested on Marvin's album Into the Light on the track "Pipeline". Marvin and the Shadows reformed for a 2004 Final Tour, and a 2005 European tour was also organised. Marvin dueted twice with French guitarist Jean-Pierre Danel – on his 2007 and 2010 albums, both top-ten hits and certified gold. Their two singles hit the iTunes charts in France, Norway, Finland and Germany, and later (when released as an EP from Danel's compilation The Hit List) in Ireland, United Kingdom, Poland, United States, South Africa and Thailand. Marvin also participated on one of his DVDs and wrote the foreword for Danel's book about the Fender Stratocaster. While Welch and Bennett became the Officers of the Order of the British Empire (OBE) in the 2004 Queen's Birthday Honours List for services to music, Marvin declined for "personal reasons". On 28 October 2009, Marvin was presented with a BASCA Gold Badge Award in recognition of his unique contribution to music. In London, "Hank Marvin" is cockney rhyming slang for "starvin" ("starving"). This slang, originally conceived by Marc Lowry of Leicester in 1978, was referenced in a 2012 television advertisement for Mattessons meat company. His first wife was Beryl, with whom he had four children. He is currently married to Carole, with whom he had two children. Since 1986, Marvin has lived in Perth, Western Australia. He has made impromptu appearances on stage when musician friends visit the area, such as in February 2013 when Cliff Richard held a concert at Sandalford Winery. He is a Jehovah's Witness. Marvin runs a recording studio, Nivram studios, part of Sh-Boom studios in Tiverton Street, Perth, owned by Trevor Spencer and Gary Taylor. He has also developed a keen interest in the music of jazz guitar legend Django Reinhardt and performs regularly with his group, "Hank Marvin's Gypsy Jazz", whose repertoire consists of a mix of Reinhardt originals and new tunes composed in the gypsy jazz genre. Despite being widely imitated at the height of his fame, Marvin's playing style is distinctive and instantly recognisable, characterised by fluid use of the tremolo arm (usually of his signature red Fender Stratocaster) with a volume pedal to achieve a particularly expressive sound that compensated for the lack of vocal content in much of his work. Marvin influenced many British rock guitarists, including Andy Summers, Syd Barrett, George Harrison, Eric Clapton, David Gilmour, Brian May, Mark Knopfler, Peter Frampton, Steve Howe, Roy Wood, Tony Iommi, Pete Townshend, Ritchie Blackmore, Jimmy McCulloch, Andy Powell and Jeff Beck. Australian guitar virtuoso Tommy Emmanuel has also paid homage to Marvin on various recordings. In Canada, Cliff Richard and the Shadows had top 10 hits, especially from 1961 to 1965. Canadian guitarists Randy Bachman and Neil Young credit Marvin as influential, Young penning the song "From Hank to Hendrix" on his Harvest Moon album in partial tribute. Des O'Connor – Another Side Des O'Connor – LP – NSPL 18559. Flair – Stop Look & Listen – LP – MLP 15611. 1976: Evita: guitar on "Buenos Aires"
1977: Roger Daltrey One of the Boys – guitar on "Parade" and "Leon"
1979: Wings Back to the Egg – "Rockestra Theme" and "So Glad to See You Here"
1983: Tracey Ullman You Broke My Heart in 17 Places: guitar on "Move Over Darling" and "You Broke My Heart in 17 Places"
1983: Leo Sayer Have You Ever Been in Love : guitar on "Don't Wait Until Tomorrow"
1989: Jean Michel Jarre Destination Docklands: guitar on "London Kid" and "Rendez-Vous IV"
1995: Alan Jones A Shadow in Time album: guest on title track "A Shadow in Time"
2004: The Strat Pack: guitar on "The Rise and Fall of Flingel Bunt," "Sleep Walk" and "Apache"
^ "No. 42885". The London Gazette. 4 January 1963. p. 197. ^ a b c Hank Marvin – Guitar God. ^ Boynton, Graham (25 September 2009). "Hank Marvin: 'We should have taken Harrison's advice and sung'". Telegraph.co.uk. Retrieved 6 March 2018. ^ Barnes, Jim; Dyer, Fred; Scanes, Stephen (1986). The Book Top Forty Research 2nd Edition 1956-1985 (doc). Top Forty Research Services, N.S.W., Australia, after having been "discovered" by two DJs at 2WG Wagga Wagga. ^ "Actor Hurt leads Queen's honours". BBC News. ^ "H". London Slang. 4 May 2010. Archived from the original on 6 January 2012. Retrieved 31 December 2011. ^ "'Hank Marvin' stars in new Mattessons advert". MusicRadar. 21 June 2012. Retrieved 17 December 2012. ^ "The tragic family rift that proves blood is not always thicker than water". The Independent. Retrieved 21 December 2014. ^ Nick McGrath. "Hank Marvin: My family values". The Guardian. Retrieved 21 December 2014. ^ Ross, Deborah (17 March 1997). "Specs, God and rock'n'roll". The Independent. London. ^ a b c d "Hank Marvin: Everyone Has To Move On". ultimate-guitar.com. 25 September 2007. Archived from the original on 2 April 2015. Retrieved 24 June 2014. ^ "Mark Knopfler introduced him as one of his all-time favourite guitar players at the Dire Straits' 1985 Wembley concert where Hank duetted the song "Going Home" from the film theme Local Hero". YouTube. Retrieved 29 May 2018. ^ Whitaker, Sterling C. (2003). Unsung Heroes of Rock Guitar. Booksurge. p. 111. ISBN 1591097584. ^ Prown, Pete; Sharken, Lisa (2003). Gear Secrets of the Guitar Legends: How to Sound Like Your Favourite Players. Hal Leonard. pp. 63, 66. ISBN 1617745014. ^ Marten, Neville; Giltrap, Gordon (2010). The Hofner Guitar: A History (2 ed.). Hal Leonard. p. 40. ISBN 1423462742. ^ Gulla, Bob (2009). Guitar Gods: The 25 Players Who Made Rock History. ABC-CLIO. pp. 133–134. ISBN 0313358060. ^ Giuliano, Geoffrey (2002). Behind Blue Eyes: The Life of Pete Townshend. Rowman & Littlefield. p. 16. ISBN 0815410700. ^ Clayson, Alan (2002). The Yardbirds: The Band That Launched Eric Clapton, Jeff Beck, Jimmy Page. Hal Leonard. p. 46. ISBN 0879307242. ^ Bachman, Randy (2012). Randy Bachman's Vinyl Tap Stories. Penguin. p. 155. ISBN 0143185772. ^ Roberts, David (2006). British Hit Singles & Albums (19th ed.). London: Guinness World Records Limited. p. 264. ISBN 1-904994-10-5.